CRITICAL THINKING SKILLS "Trust Your Guts?" | MICHAEL D. YAPKO, Ph.D.
It’s common to hear people make resolutions at the beginning of the year to exercise their bodies more, but what about exercising their brains? Developing critical thinking skills is a way of exercising your brain. We begin teaching our children about how to think critically very early in their lives, usually as it relates to safety. For example, kids learn what is okay to touch and what’s not okay to touch (e.g., “it’s hot!”, “it’s sharp!”). We teach them about ‘strangers’ and how to assess who is likely to be safe and who is not. As children enter school, critical thinking becomes more structured and deliberate through exposure to math and science. Critical thinking skills are also learned in a less formal way as young children begin to acquire social skills; they must learn to determine who their real friends are and whom they can or can’t trust. In psychotherapy, we also teach critical thinking skills. When someone comes in and presents an anxiety or phobia, we need to find ways to help them differentiate real from imagined fear. When someone presents with depression, we need to provide tools that help them learn to determine whether what they’re thinking and saying to themselves is true or if they’re making the mistake of thinking things and then non-critically believing themselves. We teach people how to do “reality checks, ” i.e., how to go outside themselves to learn if their inner thoughts are true or not. Most recently, the idea of critical thinking is being addressed in association with the term “Fake News.” With all the input we now receive based upon our technology and social media with hand held devices feeding this information to us 24 hours a day/7days a week, people are often on cognitive overload. They may not take the time, or know how, to determine whether what they’re reading or hearing is actually true, especially if it is in line with their preconceived ideas on a particular subject, person, or experience. 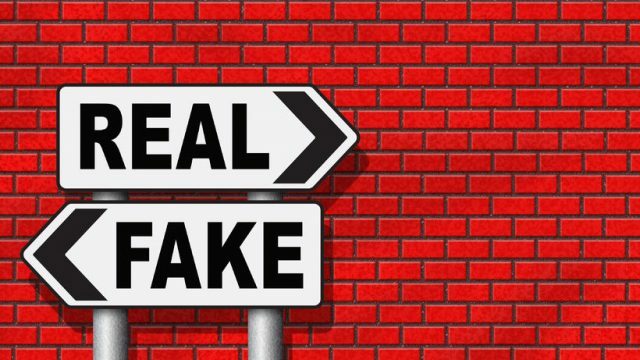 In an excellent online article from National Public Radio (NPR) entitled “Learning to Spot Fake News: Start With A Gut Check”, author, Anya Kamenetz highlights the importance of work being done to help university students in the U.S. to learn how to fact check before sharing online content. It was the subtitle, “Start with a gut check” that grabbed my attention. Often, therapists say, “trust your guts” and they typically mean you can trust your feelings as a valid indicator of how to make choices. I have been saying for years, “Your guts can lie to you! Trust your guts sometimes.” See my book The Discriminating Therapist for an in-depth understanding of how to make choices Including when to listen to your feelings and when to override them. So, I was intrigued that starting with “a gut check” was a way to spot fake news. Much to my surprise and pleasure, the “gut check” refers to recognizing that if you’re reacting emotionally to what you’re reading or hearing, that’s the first clue to stop and fact check! It’s too easy to let your emotions get the best of you. The article focuses on a free online textbook by Michael A. Caulfield, entitled Web Literacy for Student Fact Checkers. In the book, there is a page of Fact-Checking Sites that appears to be a valuable resource I want to share with readers of this newsletter. I think we can all benefit from learning how to keep our emotions in check long enough to be sure of our facts before spreading them as truths. As important as it is that universities are getting onboard with teaching these skills, it is noteworthy that Italy is beginning to address this issue at the high school level. See Jason Horowitz’s article in The New York Times online “In Italian Schools, Reading, Writing and Recognizing Fake News“. But, being proactive and teaching our youngest minds is the key to making significant change in the next generation. It is particularly encouraging to report that Sweden is bringing critical thinking skills into the classroom starting as early as primary school by bringing in a program to teach digital programming. Included will be recognizing reliable and unreliable sources of information. Of course, fake news is a complex issue and there’s no single resolution. But, the more educated and critical we are in our ability to assess the information we’re given, and the more non-complicit we are in mindlessly sharing information that may propagate misinformation, the better choices we can make that will improve all aspects of our lives.